When it comes to a New England vacation, New Hampshire offers some of the most authentic and iconic places to visit. This small, coastal state is perfect for year-round holidays. New Hampshire boasts some of the largest ski mountains along the East Coast, which makes it a perfect escape for couples who are looking for a picture-perfect winter escape, or somewhere to go during the holiday seasons. During the summer time, New Hampshire is a popular destination for summer cottages, water sports, and exploring some of the beautiful landscape and scenery. New Hampshire geography consists of mountainous regions, miles of forests and woods, lakes and even pieces of the coast. 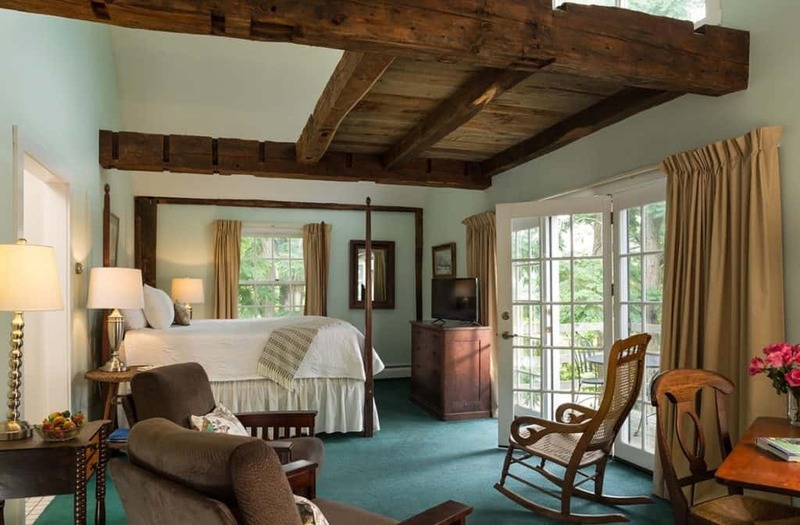 Couples who are looking for a historic, colonial bed and breakfast will be able to find the best of the best, along with those who are just looking to escape to a cabin in the woods for a weekend. Whatever your taste, New Hampshire is sure to deliver some of the best romantic getaways that New England has to offer. Nestled in the very heart of New Hampshire’s White Mountains region, the Mountain View Grand Resort is surrounded by the wonder and beauty of New Hampshire’s landscape, while still offering all of the elegance and luxury amenities of first class resorts. There are 141 guest rooms and suites for couples to enjoy, each one blending seamlessly into the stunning views that are just outside the window. Dining can be casual and fun, or relaxed and formal. Mountain View Grand Resort offers several different dining venues, each with a farm-to-table menu from casual to fine dining. Onsite at the resort, Tower Spa awaits couples who can’t wait to let the stress of their day to day lives melt away with a luxury spa treatment. Along with the spa, Mountain View Grand Resort offers an array of activities, from golfing to white river rafting. 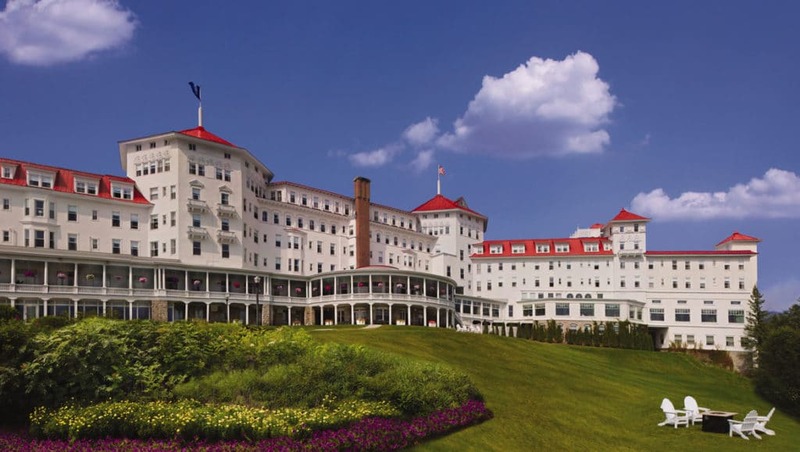 Located in Bretton Woods, the Omni Mount Washington Resort is a luxury escape that has been a retreat for famous poets, celebrities, and even presidents of years long past. Couples will enjoy any one of the resort’s numerous guest rooms or suites where they can get a stunning, panoramic view of the nearby Presidential Mountain Range. The resort and rooms have a beautiful Spanish renaissance style and architecture, along with luxury amenities. The Main Dining Room at the resort serves breakfast and dinner every day, while other onsite restaurants also offer their own unique and delicious cuisine, from a pub and steakhouse to a speakeasy style bar. Omni Mount Washington Resort has endless activities to explore, such as a golf range, a luxury spa, canopy tours and trail rides at the local equestrian center. 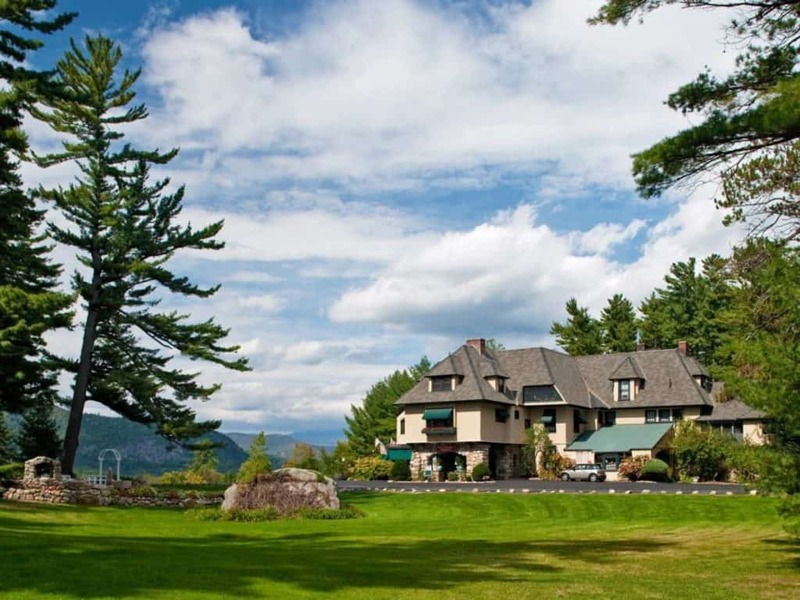 The Eastern Slope Inn Resort is an elegant and historic building, offering both luxury accommodations for guests as well as a peek into the past. Located in North Conway Village, the resort is part of the National Register of Historic Places. Couples will be surrounded by 40 acres of lawn and gardens, perfect for a secluded vacation while also being within quick walking distance of the nearby town. The Eastern Slope Inn Resort offers 250 different rooms and suites that have a throwback of historic charm, updated with modern amenities. Flatbread Company is the onsite restaurant at the resort that offers organic and local ingredients, as well as artisan dishes that are handmade from an earth stone oven, perfect for breakfast, lunch and dinner. While the Eastern Slope Inn Resort does offer an indoor pool, there are even more fun activities to explore around the resort, from hiking to kayaking to ice-skating in the winter. 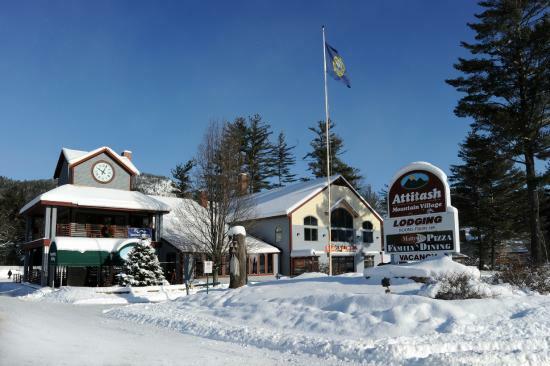 Perfect for a winter escape, the Attitash Mountain Village resort is located at the base of the Attitash Ski Resort in North Conway. The resort is surrounding by the beautiful mountain peaks, covered in native pine trees, offering a picturesque winter escape. Accommodations include 350 guest rooms and suites, though couples who are looking for an extra bit of privacy can rent out a townhouse or trailside accommodations, with Jacuzzis and kitchens. The onsite resort, Matty B’s, offers everyone’s favorite foods, from pizza to burgers, as well as home-cooked dinners that everyone will enjoy. Matty B’s is perfect for couples who are looking for casual fun rather than fine-dining. While the Attitash Mountain Village offers an array of summertime activities as well, some of the most fun will be found during the snowy season, with discount ski lift tickets and any one of the resort’s Ski and Stay packages. 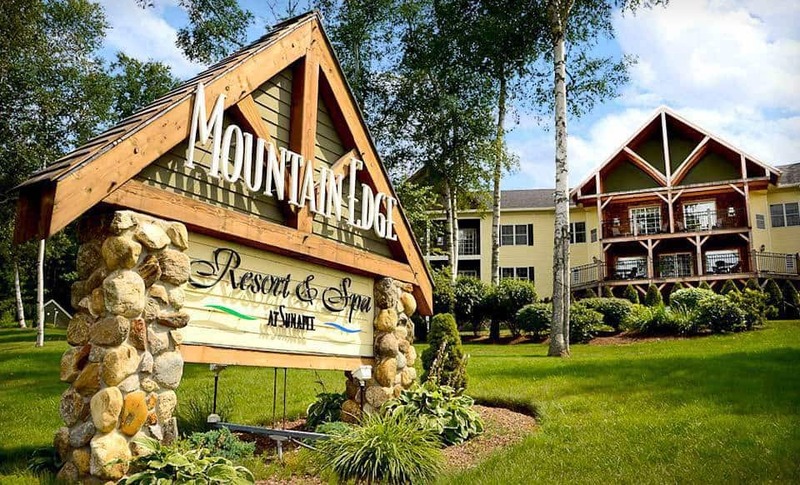 Nestled in an unspoiled region of New Hampshire, the Mountain Edge Resort and Spa boasts beautiful surroundings, like Lake Sunapee and the nearby New England villages. This is the perfect escape for couples who are seeking a break from the hectic big-city life. The Mountain Edge Resort offers all-suite accommodations, with one and two-bedroom suites, including a penthouse with a living room and kitchen, for couples who want to live in both seclusion and luxury. The Mountain Spirits Tavern is located onsite at the resort, and it offers full menus along with drinks and seasonal specials. The Tavern is open Wednesday through Sunday, from 4 PM to closing. The Mountain Edge Resort offers a romance package perfect for couples that include a couple’s massage and dinner for two. For nearby attractions, there are adventure parks, ski resorts, and even an opera house. This scenic, hidden treasure is tucked away between the hills and the mountains, beckoning couples who are looking for that perfect, quiet escape among the quiet New Hampshire countryside. The Darby Field Inn offers both classic and deluxe room styles, with gas fireplaces, balconies, and even a 2-person Jacuzzi tub. Classic rooms are great for the outdoorsy couple who only need a place to sleep, while the deluxe is perfect for the couple who wants to enjoy every second in a home away from home. The Darby Field Inn offers a full country breakfast, complimentary with every guest stay. Dinner is also served by reservation only, with a menu that changes with the seasons. The Darby Field Inn offers both therapeutic couples massages, as well as prenatal massages for the mother’s to be getting in that last romantic weekend. The surrounding area offers activities for every season, from horseback riding in the summer, to cross-country skiing in the winter. 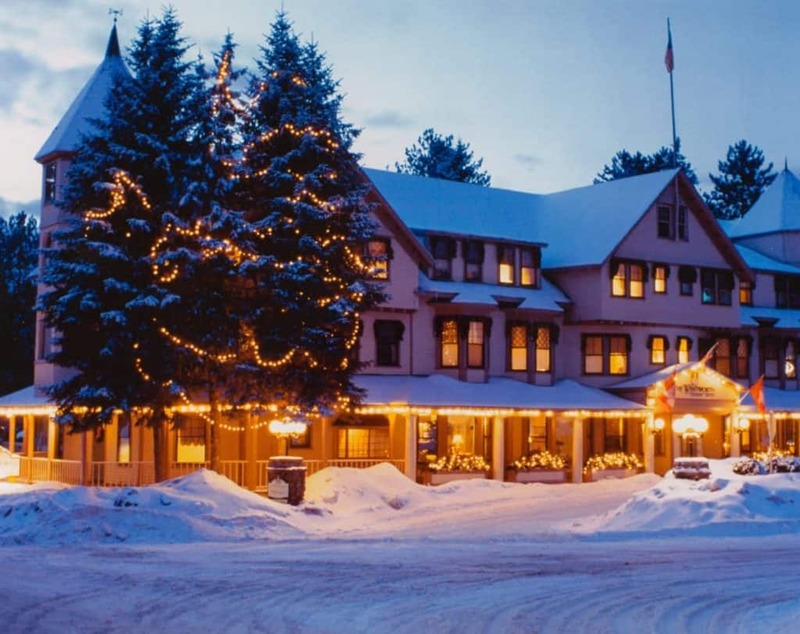 The Wentworth is located in the White Mountains region of Jackson, New Hampshire, and it offers an authentic, charming country inn experience. The Wentworth offers 61 different rooms within the Inn, which will give couples a secluded feeling that some of the larger hotels and inns can’t manage. Each room offers a unique, European decor, while the available condos offer a private escape for couples seeking a little more solitude. The Wentworth offers farm-to-table dining that specializes in local and organic cuisine. Couples seeking a romantic dinner will find just the atmosphere they’re looking for at the onsite restaurant. Because of the location surrounded by Jackson Village, couples will have a blast with both local festivals and attractions, as well as outdoor activities that range from golfing next door, horseback riding and canoeing. 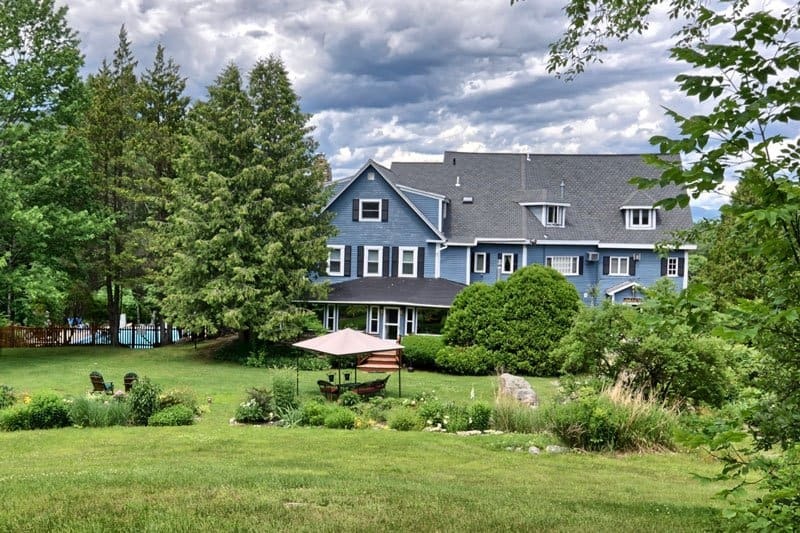 The Stonehurst Manor, located in North Conway, is a secluded drive away from all the hustle and bustle of the rest of the world, surrounded by natural pine and rolling hills. The Stonehurst Manor offers a peek into the past with the original 1872 ambiance and modern amenities. The accommodations range from manor rooms to mountain view wings, and even rooms with fireplaces and Jacuzzis, for couples who are looking to stay in style. Both breakfast and dinner is included in the room price, with meals that are made fresh every day with local ingredients that make all of the favorite New England dishes taste divine. Stonehurst Manor is perfect for couples who like a bit of outdoor fun, including golf, horseback riding, and canoeing along the Saco River. Wentworth by the Sea is a New England island experience. 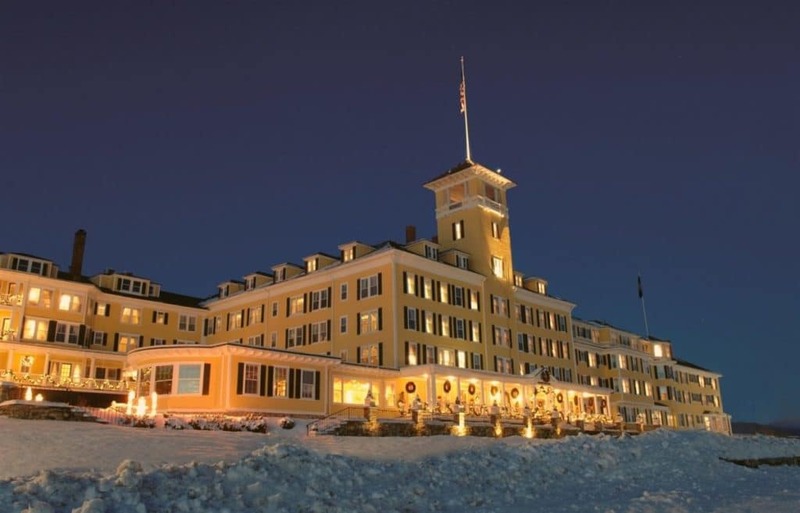 The hotel itself offers both historic ambiance and modern amenities This particular hotel is located on the island of New Castle, which is one of New Hampshire’s oldest settlements and filled the brim with history. There are 161 different guest rooms and suites that overlook the harbor, and even have a cozy fireplace to curl up next to during the chilly autumn evenings. Located onsite at Wentworth by the Sea are two dining venues that offer American style cuisine and two distinct dining experiences, from a waterfront restaurant to a more casual style. The Wentworth by the Sea offers a full-service spa, so couples can unwind together from their day to day life. For a day out on the water, there’s the Portsmouth Harbor Cruises, or the Portsmouth Kayak Adventures. Located along the peaceful shores of Lake Winnipesaukee, in the quiet town of Meredith, sits the Inn at Mill Falls. This 19th century linen mill has been restored into an inn that offers couples the chance to relax and rejuvenate among the quiet and quaint New England villages. There are 54 rooms available at the Inn at Mill Falls, and the Inn itself is nestled right next to a 40-foot waterfall that completes the stunning beauty of this property. Couples will have no shortage of places to choose from when it comes to finding the perfect place to dine. The surrounding area of Meredith offers an array of restaurants that range from breakfast fare to Italian favorites. For summertime fun, the EKAL Lake Activity Center is ready to help everyone find just the thing they want to do, from stand-up paddle-boarding to boat cruises along the water. The Inn at Ellis River offers a little more seclusion and privacy for couples seeking a place to enjoy their romantic getaway. This bed and breakfast is located at the edge of Jackson Village, and offers 21 different rooms, as well as a cottage for couples who want some real privacy. The rooms and suites at the Inn at Ellis River offer balconies that overlook all of the stunning scenery that surrounds the property, as well as fireplaces to cozy up during the colder months. The Inn at Ellis River offers breakfast each morning to guests, with an array of fresh fruit, homemade granola, as well as freshly baked sweets like muffins and coffee cake. There are also hot entrees, like sausage and bacon or pancakes. The Inn offers several romance packages from couples, including a summer romance package, a honeymoon package, and even a babymoon package for expecting couples. This New England farmhouse has been renovated into a quaint bed and breakfast, located in Chesterfield with beautiful views overlooking the River Valley. The Main Inn building and the connecting barn shed have been renovated in 1984 to make beautiful and comfortable guest rooms. Couples will have their choices of nine different rooms inside the Main Inn building. For a little more privacy, couples are welcome to stay in the Cottage, with only two rooms. Dinner is served at the onsite restaurant at the Chesterfield Inn, with popular New England cuisine that has fresh and unique flavors added to the mix to make each meal unforgettable. Whether you want to explore the surrounding area by bike or hiking trail, or if you’re more interested in the art and museums that Chesterfield has to offer, everyone can find something to enjoy in the surrounding area of the Inn. 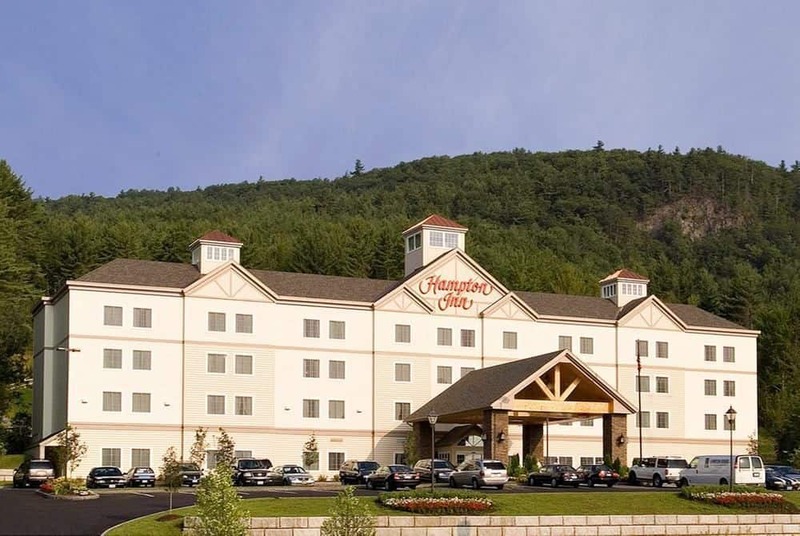 Littleton is the home of the Hampton Inn, among the White Mountains region of New Hampshire. The Hampton Inn is located just a few minutes away from downtown Littleton, as well as an array of nearby attractions and entertainment. The Hampton Inn offers both standard guest rooms as well as spacious suites for couples who are looking to travel in comfort at an affordable cost. The Hampton Inn offers a free hot breakfast with every guest’s room, with favorites like eggs, bacon and coffee. For couples who are on the go, the Hampton Inn also offers healthy grab-n-go breakfast bags. Year-round fun can be had in Littleton, with the Hampton Inn as the central location to explore it all, like the Whale’s Tale Waterpark or Bretton Woods with 434 acres of skiing terrain. Downtown Littleton is also full of shopping, restaurants and quaint surprises. Visit and stay at the oldest inn that New Hampshire has to offer, in business since 1789 during the Revolutionary War. 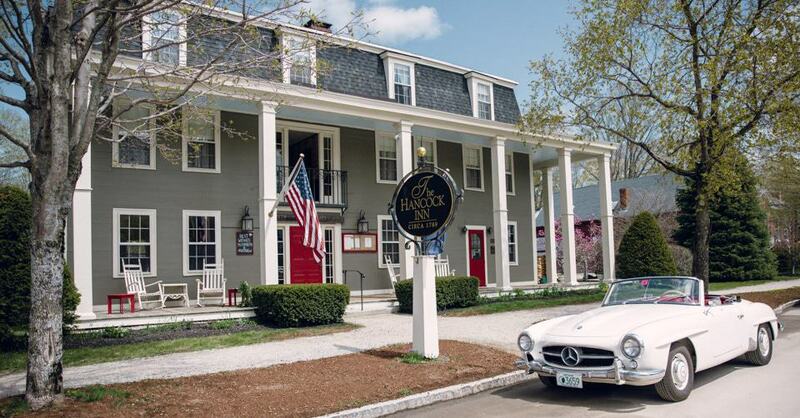 The Hancock Inn is located in in Hancock and offers nothing but hospitality that is hundreds of years old, along with modern day amenities. Accommodations include small, cozy rooms, classic rooms and superior rooms, each with period-appropriate furniture and unique decor for each room. The Fox Tavern is open Tuesday through Saturday for dinner, and it’s the Hancock Inn’s onsite restaurant where couples will be able to enjoy a menu that changes seasonally, and offers all the best New Hampshire cuisine. Hancock is located in the Monadnock Region of New Hampshire, and offers an array of things to do- from shopping, to historic tours, to outdoor fun like canoeing along the river. 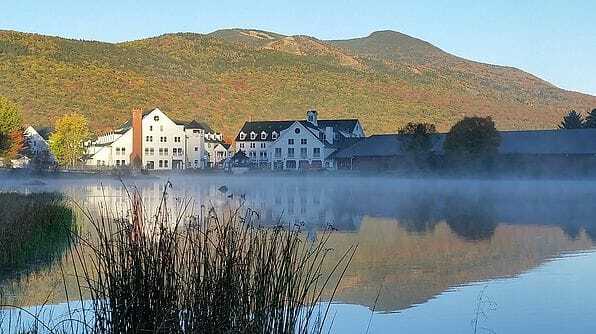 Black Bear Lodge is located in Waterville Valley, surrounded by nature that’s close enough to touch. The Black Bear Lodge has all-suite accommodations, so couples will never have to choose between comfort and affordability. There are 107 different suites, along with different style suites including superior suites that include a kitchen, and loft suites with forest views. Although the Black Bear Lodge doesn’t include an onsite restaurant, the surrounding town of Waterville Valley offers an array of different restaurants ranging from Mexican to Italian. The location makes Black Bear Lodge perfect for couples who are seeking an outdoor vacation, with hiking, canoeing and even wintertime sports available nearby.